Description: Gold and silver, diamonds and sapphires! This Queen of Bling knows it ain't no thing. Style her for a wild ride in her new whip. Instructions: Use your mouse to click on and through the floating clothing, hair, background, bling, accessories, and car options for a fun ride with the queen of the streets. Breath in that salty ocean air, throw your head back and really feel it: You're the queen of the ocean and everywhere all around you is your kingdom. Your nails are to your wedding what your gown is to your body. 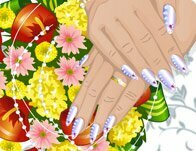 Complement your shimmering nuptial bling with some sweet, pretty nail decals and polish!